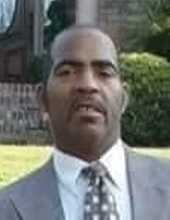 Alvin Dewayne Thomas, 57, of Decatur passed away on Thursday, April 4, 2019 at Barnes Jewish Hospital, St. Louis, MO. Alvin was born on February 22, 1963 in Decatur, Illinois the son of Marzine and Lula Burdean Thomas. Alvin was educated in Decatur Public Schools and was formerly employed at PPG and ADM as a forklift driver. He leaves to cherish his loving memories: his daughter, Ashley Rene Thomas (Deontae) of Decatur, IL; grandchildren: Zy'llina Laster and Zy'merrion Mays; brothers: Maurice Thomas, Marlon (Carmen) Thomas and Marvin (Patricia) Thomas all of Decatur, IL; sister, Elna (Bill) McIlwain of Duluth, GA, close friends, Dan, Dale and John and a host of aunts, nieces, nephews, cousins and friends. To send flowers or a remembrance gift to the family of Alvin Dewayne Thomas, please visit our Tribute Store. "Email Address" would like to share the life celebration of Alvin Dewayne Thomas. Click on the "link" to go to share a favorite memory or leave a condolence message for the family.